Originally uploaded by Big Sister. On the request of BijouxMaster for Texas Purl Girl, I am posting my knitting resolutions for 2008. While I am hesitant to write checks my needles might not be able to cash, I can't resist the urge to put this out there. (1) Participate in MamaMarce's Knit All Year Long Along to prevent the inevitable holiday stress-fest. (3) Keep working the stash. I can't say I won't buy, but I am going to try to stay away from large amounts of yarn and sock yarn. When I buy I want to try to use it at the time. (4) Try my hand at spinning. (5) Swatch. I swatch for projects, but I would like to take some time to swatch for the love of the knit. This list is short, but I wanted to try to keep it realistic and fun for me. I have to say that I would like to see knitting needles cash checks. *g* :) Just kidding.. nice list! :) I'm totally signing up for the year long gift knitting. I actually have a list of things I want to knit for people for next year. I think the only way that I will do it is to knit all year, probably one or 2 gifts a month. A short list is a doable list. Good stuff on here - happy to have you knitting along! Merry Christmas, Nicole! Hope you are enjoying your getaway. Your list looks completely reasonable. I think you'll finish Babette in '08! 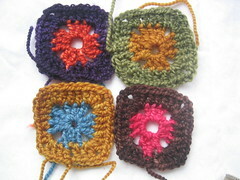 One square a week seems completely do-able (even though I don't really crochet). I'm looking forward to joining you in the gift knit-along. I'm pretty excited about having gifts ready before crunch time. Good luck with the resolutions- it looks totally do-able. I can help you with the spinning, but it's another serious addiction, with an accompanying stash problem too!